WOW! That is what I can say, when I last blogged, I was just about to leave for India, and then I went to China and then Israel and now I am back. In a single sentence – there is very little to no good kosher wine in Asia, which is a shame! I was thinking of shlepping my own wine, but truly it would not have been worth it. In the end, I suffered a bit, drank beer and some absolutely undrinkable wine (which was all I needed for a blessing), while in India, the Rabbi made Kiddish on grape juice (which I refused to drink!). What can I say, it was a truly bad string of wine weeks, that culminated in a great wine weekend with a BUNCH of great Malbec wines and then a trip to Israel (yeah a snowed in Jerusalem – coming next). Purim came and went and with it we had the opportunity to taste many a wine. Some of the wines were mevushal and some were not. On the whole, the mevushal wines did the worst, but hey that is not an iron clad rule, as described on my blog of what is kosher wine. Also a slight disclaimer, it was Purim after all, and I did drink these wines – so the notes many be a bit light or off, but I would not print it if I did not believe it. Some of these were mine and some were wines that others brought. In the end, we tasted three Pinot Noir, and the other two could not even hold the Four Gate Pinot Noir’s jockstrap. Instead, the Eagle’s Landing and Barkan Classic just stood around and were not even finished – we are talking about purim! With many people coming over to our table for wine – none could finish those bottles. Last week I was invited by my friend to his house to taste a wine I do not have access to, as it is only available to Herzog Wine Club members. The wine is the 2008 Eagles Landing Sauvignon Blanc. 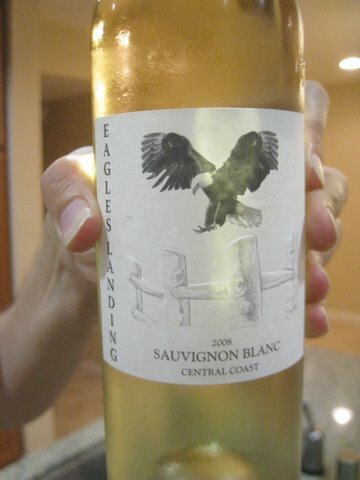 Please DO NOT confuse Herzog’s Eagles Landing wines with the Iowan Eagle’s Landing Winery – that is NOT kosher! Disclaimer – I do NOT work for Herzog, but this question keeps coming up on Daniel Rogov’s forum. “Eagles landing is similar to Herzog reserve and Weinstocks cellar select (reserve) wines. Meaning same winemaking (and attention to grape selection) care with perhaps a slight difference and oak treatments etc than the Herzog reserve, without the ‘kosher’ recognizable brand labels. It was created as a direct request of one of our largest distributors, who recognized the, ‘Herzog reserve quality but wanted something that was not recognized as kosher, for non kosher restaurants’ (paraphrasing their words not ours). Voila, Eagles landing was born”. In full disclosure, the Sauvignon Blanc bottle I tasted had a clear and present OU certification on the back label. I admit this is a bit different from all other Herzog bottles, which have the OU on the front and back. However, the Chardonnay bottle that my friend also received from the wine club, had ZERO kosher certification on the labels, but one was added to the bottle after the labeling was complete. A friend that I respect told me that the most recent Eagles Landing Cabernet Sauvignon was less than exciting, while the Chardonnay was nice. I tasted the Sauvignon Blanc and that was OK, but a bit funky. It is an interesting marketing idea and one that I hope gains some sea legs, as it is about time for Kosher to lose its stigma. The Waterford Lismore Reserve wines were received with a far more warm reception from my friends. I hope to taste these wines one day. Till then I will rely on my friends to keep you all up to date. We were invited for Friday night to a different friend’s house, so no recipes or other designs. That said, we brought a fun bottle of ELVI Wines Classico from Spain to our friends and they shared an interesting bottle with us as well. Finally (one more), some friends of mine swung by the house and I cracked open a wonderful bottle of the 2004 Yatir Blend. We had this bottle for a fleeting moment at the Carlebach Shabbaton. This time I had more time with the wine. There is no change to report about the initial blush of this wine, but some more data about how it acts after a few more hours. So, it was a nice wine filled weekend and one that I am happy to share with you all. The nose on this straw colored wine starts off with a nasty damp and almost petrol smelling “aroma” that dominates the nose and takes forever to blow off. Once the nose clears up, it has displays kiwi, tart lemon, slight oak, nice butterscotch (from the oak), and a balancing orange peel. The mouth on this medium bodied wine starts off tart and acidic but rounds out over time. This is not a crisp Sauvignon Blanc, and is not a bottle that will ever travel there. The mouth starts with lemon and kiwi. The mid palate flows into a round-like acidic core with orange peel peeking out from under the acid haze. The finish is long, spicy, and tart with orange peel and slight custard notes. As this wine opens, it shows far more oak extraction. The wine fleshes out with a nice bright, round, spicy, and butterscotch persona. This is not your classic Sauvignon Blanc, but then, this is not a wine that everyone gets to taste, so why not shake it up a bit. Cool. The nose on this garnet colored wine, which is a blended wine of 87% Tempranillo and 13% Merlot, is ripe with plum, cherry, raspberry, and spice. The mouth of this medium bodied wine is soft with raspberry, cherry, and plum. The mid palate is bright with core acidity and a hint of coffee. The finish is medium long and spicy with more acid, soft tannins, coffee, and pepper/spice. This winery keeps delivering. PLEASE NOTE – This is the ONLY Mevushal wine from the Elvi Wines group. All other wines from them are not Mevushal. This wine has a fair amount of lore, much of it not true. That said, it was a lovely wine some time ago. It is also a wine that the wine maker was still selling on his web site a few months ago. Recently he starting liquidating his stock, and it was a good idea. The bottles are hit and miss. I tasted this wine years ago and it was OK. Three weeks ago I tasted it again, while visiting a friend of mine, and it was felshy, black with ripe blackberry, nice tar, pepper, and licorice. This past week, it was not as good, though the fruit, tar and licorice were present. Still, the wine was unbalanced, off kilter, and trying too hard to make me like it. The nose on this dark purple to black colored wine is hopping with coffee to start, mint, dates, crushed herbs, rich oak, blackberry, ripe black plums, and tobacco. The mouth on this full bodied wine is concentrated with fruit that follows the nose, blackberry, ripe black plum, rich oak, along with nicely integrated tannins. The mid palate flows off the mouth with bracing acid, oak, tannin, rich tobacco, and licorice. The finish is long and spicy with ripe plum, oak, and a cloud of tobacco. This is a nice full bodied wine.